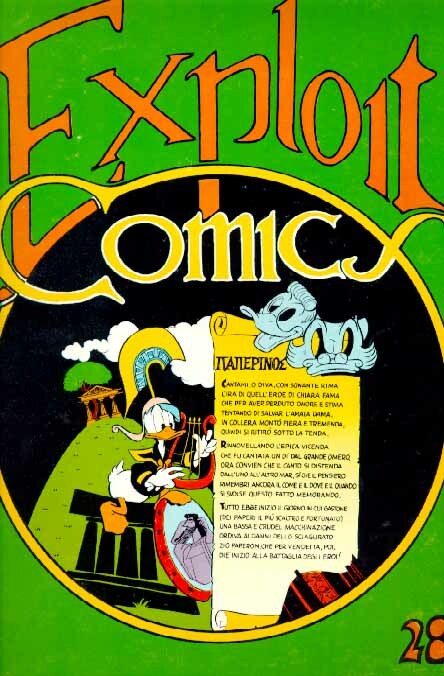 They know more than most on all sorts of comics; and, particularly in the Disney field, you'll have a hard time finding someone who matches their encyclopaedic knowledge. 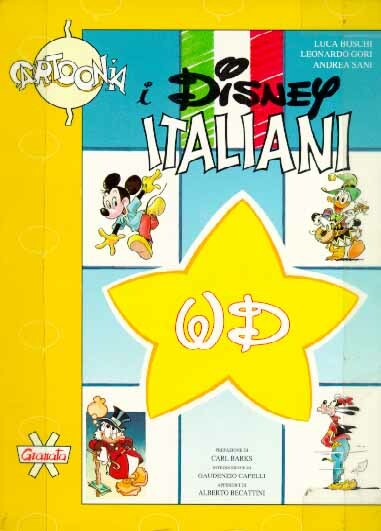 But when it comes to Italian Disney comics, they are quite simply the most authoritative source of information, period. 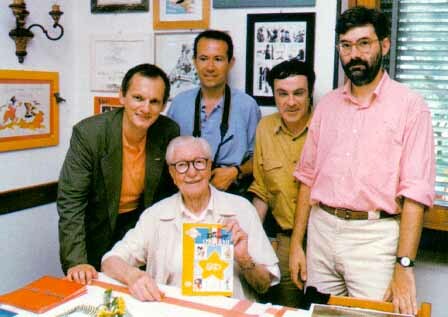 Meet the Quartetto Toscano: from left to right, Leonardo Gori, Andrea Sani, Luca Boschi, Alberto Becattini, appearing in this picture behind the great Carl Barks, the Duck Man. 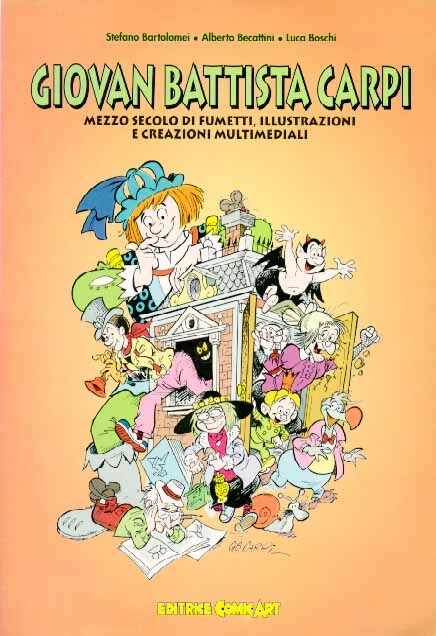 This photo was taken on the 2nd of July 1994, during Barks's famous European tour, at "U Giancu", a restaurant in Rapallo owned by a comic lover. 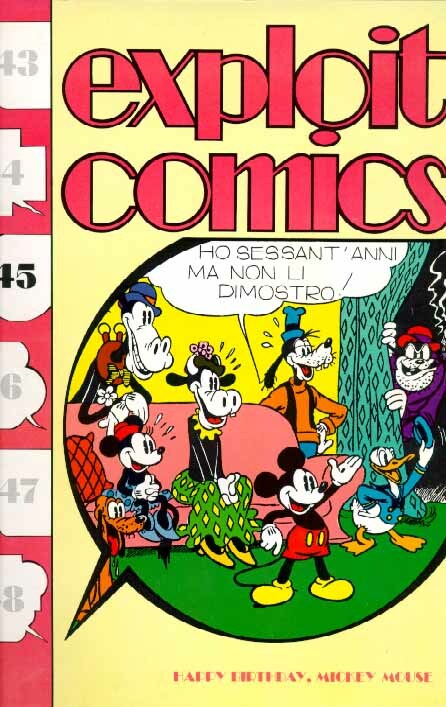 The "Quartet" actually started out as a trio (Boschi-Gori-Sani) when they wrote the Blue Book on Romano Scarpa. Someone mentioned the Three Musketeers (who, as we all know, were in fact four) because Becattini joined them as an external author to compile the bibliography (a monumental appendix listing all of Scarpa's stories in chronological order, together with their reprints). Their most famous works are the richly illustrated Blue Book and Yellow book. 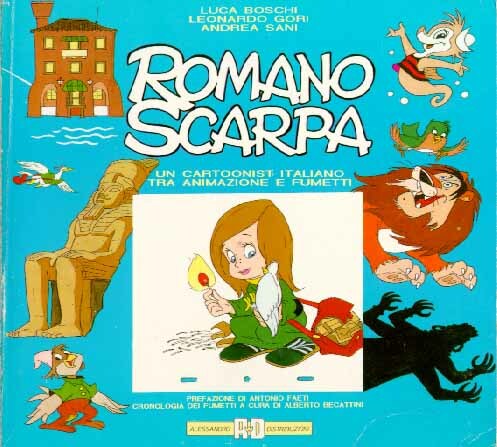 The Blue Book is entirely dedicated to Romano Scarpa. 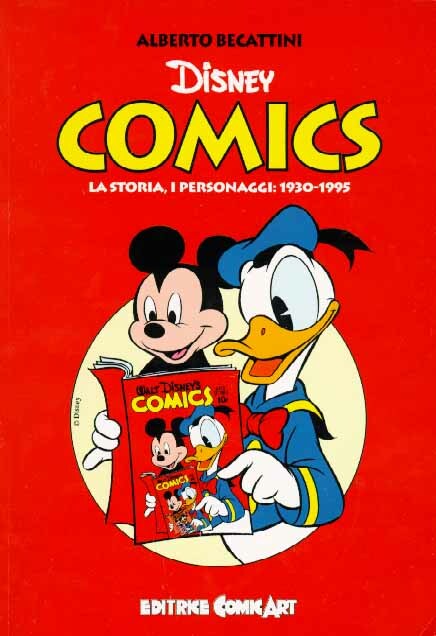 The Yellow Book (the book that Carl Barks is holding in the picture above, and for which he wrote the introduction) is an extensive treatise on all the Italian authors. If you look carefully, you'll notice that the edges and corners of my copy have been plastified. No wonder! I've consulted it so many times that it would otherwise be in pieces by now! A great book, heartily recommended. 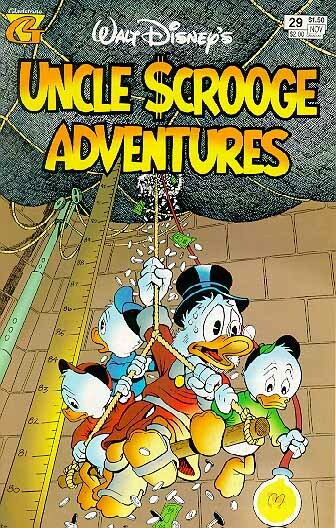 But these three books are only the best known portion of an amazingly extensive production. 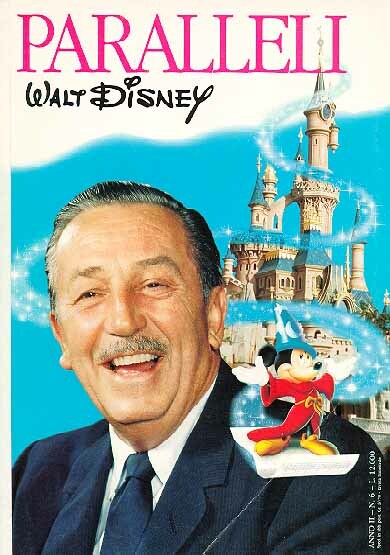 The following bibliography is an incomplete attempt to catalogue all the Disney-related articles and books written by our expert friends. I apologise in advance for any mistakes or omissions, which I'll be pleased to put right if anyone mails me with corrections. 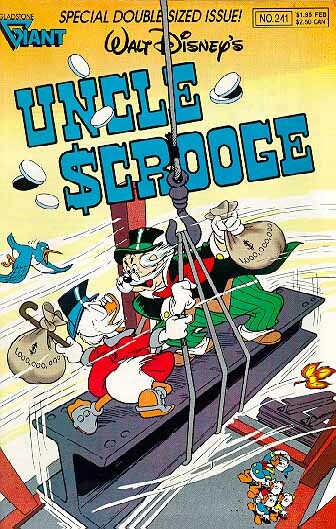 The links, where available, show a large (~50-80K jpg) picture of the cover of the book or magazine containing the text. The flags, of course, show the language in which the text is written. 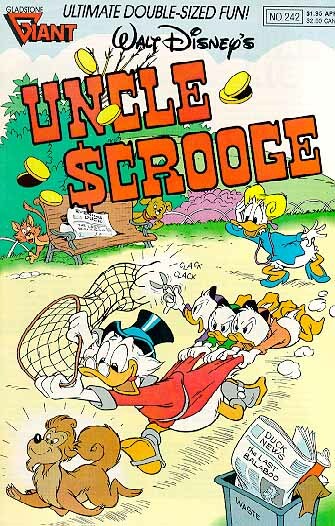 BECATTINI, Alberto; BOSCHI, Luca, "Gottfredson e Barks in arte Mickey Mouse e Uncle Scrooge"
Originally written on 1996 02 09 by hand. 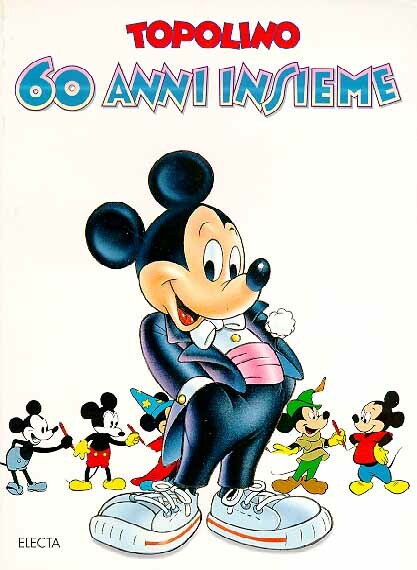 Last updated 1996 08 20.